2013 update: This pattern was one of my older, more amateur efforts, but has been revamped and re-released to meet my current professional standards- I'm pleased to introduce the new and improved Floopy! This is a great hat. Makes me wish I could knit. any idea on the yardage? i want to use some of my stash. Elsebeth Lavold Baby Llama comes in balls of 109 yards, and you want two of each color held double... I'd say if you did it solid colored, you'd probably only need about 2 or 2.5 skeins. So...um... a bit over 100 yards of something chunky but drapey? what do u mean linen and slate. Place marker just means you put a stitch marker in. Google "stitch marker" if you're unfamiliar with those. Likewise, googling "1x1 rib" should bring up some videos and tutorials which will teach you far better than I can in a blog comment. but do u have a website for me? to find what i wanna know. if u have it can u send it for me? do u have more hat patterns? No, I don't have a specific one, just type those terms into google and a lot should turn up. 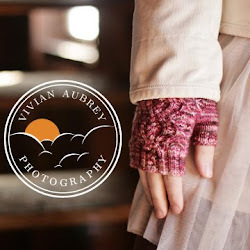 My other patterns are on the blog's sidebar to your right. why do u have to place maker ? it will look better or what? u need something to place maker? I sounds like you would benefit from some real life help from a knitting teacher, which I am not. Consider calling up your local yarn store, or even Joann's or Michael's. They usually will know of someone who can help. "k58, k2tog, knit rest of round"
I love this hat! I just have a few questions about the pattern- want to make sure i understand it all before i start. You use 7mm straight needles not circular and the stockinette is only done in the second section and no where else? It's done in the round, you'll want circular needles. The whole thing is in stockinette, except for the ribbing at the very bottom. This is so cute! It reminds me of Dopey from Snow White, and in a few days (when I can get some new circular needles, since my cheap ones busted) it will be my first knitted hat! Too cute for words. 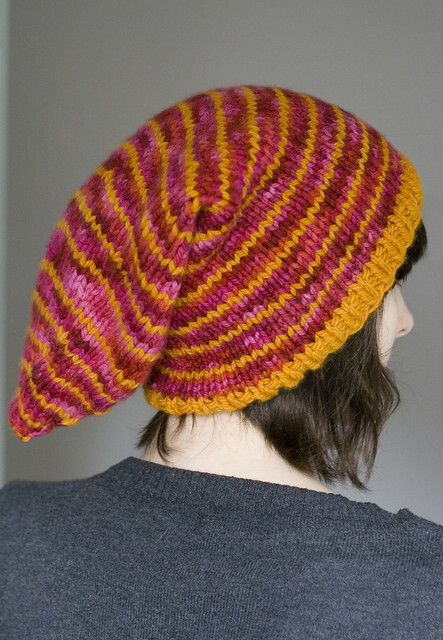 I love the hat pattern i just have a few questions. 1.When working with the circular needles are you working with one strand or two strands? 2. Is there supposed to be a seem or are the needles supposed to create a seamless hat? 3. Could it work using two straight needles with a seam down the middle? Thank you very much! You are very talented! Alright, now I feel a little silly. I have a question as well. I've never used circular needles before, and as my decreases, um... decrease, it's stretched out more tautly against the needles. Should I switch to DPN? Whew! Just thought I'd let you know, I finished it, and it's awesome and lovely and everybody I show it to envies it! In fact, a girl in my class is bringing me the yarn next week to make her one! (My hair is super-slippery, and the hat came out a bit too big for my teeny head, so I had to use hairpins to keep the hat on, but it was completely worth it!) thankyouthankyouthankyou!! By k on its own do you mean knit one stitch or knit one round? Thanks. Thanks for the pattern. I simply love it. 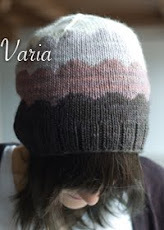 Could you possibly make this hat with straight needles? Sure, if your'e comfortable altering it. what length are your circular needles that you used? and what's the circumference and stretch of the hat? I want to make this, but I need to buy some circular needles, since I seem to have misplaced mine AND my double pointed needles. I used a 16" for the wider part and then DPNs when it gets narrower, but you could also use two circulars or a very long circular for magic loop. Hi, I chose this for my next knitting project and found a beautiful yarn I plan to use, however, it's not as bulky and I'll be knitting them with size 8 circular needle with 80-90 stitches per round (depending on how it looks). Can I just follow the pattern with the same decreases, or will it look weird? If I just do so, will it just not be quite as pointy at the end? I'm okay with that, but I just want to kind of get an idea of how it'll look. It won't look exactly the same since it's a different number of stitches, but you'll get something similar, I think. For the color that you only use one ball for, did you use the full 100 yds? I have a pretty yarn I want to use, but I might have a bit less than 100 yds. That's the brim and stripe color so I think I probably didn't use the whole yardage- you could always make the stripe smaller, too. Starting on instruction #37, when you say "repeat" do you mean repeat k19, or repeat k2tog, or repeat knitting 19 AND knitting 2 together? Both together. Sorry, this is a very old pattern- normally I would write it as "(k19, k2tog) repeat around"
Hey I just wanted to started and now I saw that the pattern is offline! Could you send it to me or anything like that? Hey I just wanted to start but the pattern disappeared! Could you send it to me too? 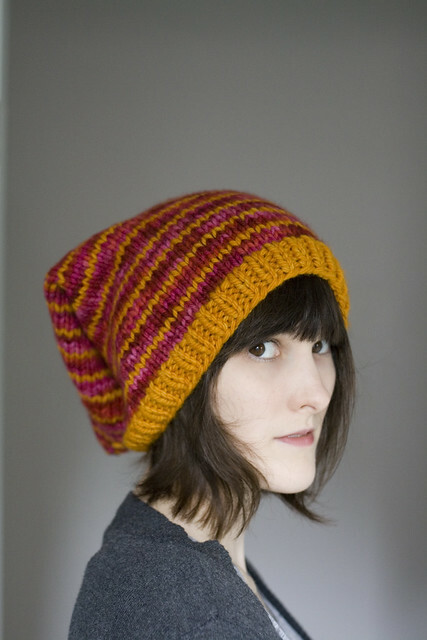 I recently found a link for this pattern and I would love to try it! However, I saw that the actual pattern is not available at the time. Is there any way I can get the pattern? 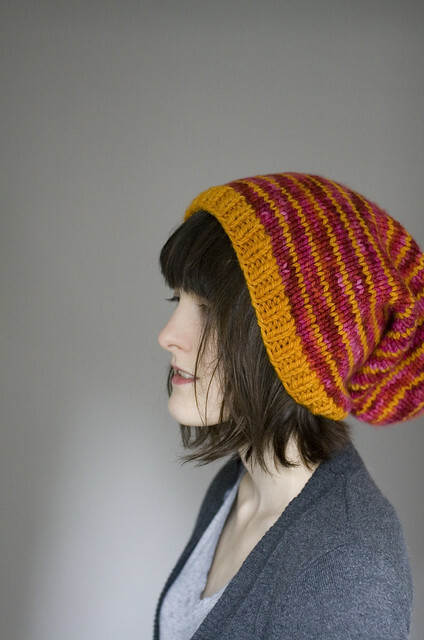 I recently found a link to this pattern and I would love to try it out! However, I found that the pattern is not available right now. Is there any way I can get the pattern? Hello! Now that Fall is upon us, I was hoping to check in on this pattern and see if it would be available soon. It looks adorable and I would love to try it. Thanks!